The paper joins others finding a significant influence of lunar gravitational (and to a lesser extent solar gravitational) effects upon long-term ocean oscillations, and that lunar-tidal cycles could explain a significant portion of the 20th century global temperature variation. Solar activity has also been shown by several papers to also be a driver of ocean oscillations including the Pacific Decadal Oscillation [PDO], one of many potential solar amplification mechanisms described in the scientific literature. The IPCC climate models do not incorporate any such lunar tidal effects or solar amplification effects, and cannot even simulate the major ocean oscillations [or clouds, convection, gravity waves, etc. etc]. Nonetheless, the IPCC conveniently rules out such natural influences on climate by hiding behind unskillful and wholly inadequate climate models which are incapable of simulating true natural variability. The impact of the 18.6-year modulation of tidal mixing on sea surface temperature (SST) in the North Pacific is investigated in a comparative study using an ocean data synthesis system. We show that remote impact through a slow ocean response can make a significant contribution to the observed bidecadal variation in wintertime SST near the center of action of the Pacific Decadal Oscillation in the eastern Pacific. A comparative data synthesis experiment showed that the modified SST variation is amplified by bidecadal variation in the westerly wind. This relationship between SST and wind variations is consistent with an observed air–sea coupled mode in the extratropics, which suggests that a midlatitude air–sea interaction plays an important role in enhancing the climate signal of the 18.6-year modulation. This result supports the hypothesis that the 18.6-year tidal cycle influences long-term variability in climate; thus, knowledge of this cycle could contribute towards improving decadal predictions of climate. 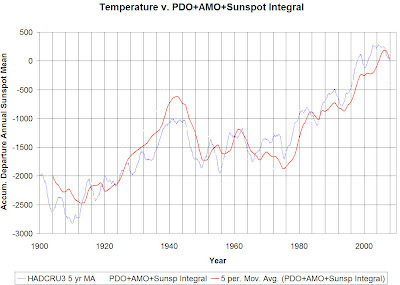 If Pacific Decadal Oscillation [PDO], and Atlantic Multi-decadal Oscillation [AMO] explains 96% of climate change over the 20th century, it may be time to ask why the most pronounced changes conjured with the two World Wars 1914-18 and 1940-45? And what is a “lunar-tidal cycle” in a water body 1000 times bigger than all aerial vapors, but is by mean only 4°C warm.IPCC climate models do not incorporate little to nothing of such basics. The problem of IPCC is that they do not define climate a scientific reasonable manner, as suggested at: http://www.whatisclimate.com/ : “Climate is the continuation of the ocean by other means”. I've made two comments, neither posted. This is only to see if a different post (reply, not comment) works. A test. If comments are closed, please make a banner or something. It is very exciting to see such a paper, perhaps even more exciting than my own nascent research into the issue of the barycenter of the Earth-Moon gravity field, since S. Osafune, S. Masuda, N. Sugiura found an effect I only suspected, and found that it had an 18-year cycle basis that I did not imagine. My sincere congratulations to Osafune-san and his coauthors. My sincere congratulations to Osafune-san and his co-authors on this ground-breaking paper! I would be interested to learn of the actual energetics of the interaction around the barycenter, although it's sensible to work with apportioning what is clearly and fundamentally the sun's work, as was done. Still, we observe a fragment of the process in daily tides in water and the energetics of that process are calculable in principle, leaving a 600 lb gorilla waiting in the earth.